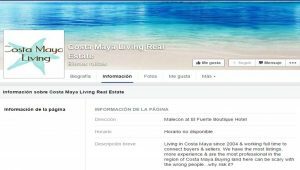 On June 25th, Mr. Stewart E. Rogers Jr. a contributor of The Yucatan Times in the Mahahual area, wrote an article regarding the Current Nature of Real Estate in Mexico (to read the article click here). As a consequence of that story, The Yucatan Times editor received an email from a Canadian citizen requesting this matter to be investigated, and its name to be omitted for security reasons as well for the possibility of taking legal action. The Yucatan Times does not get paid to publish this type of information since it is considered to be of “public interest” and under “Article 243 Bis, of the Federal Code of Criminal Procedure, as well as the amendments and additions to Articles 215 and 225 of the Federal Penal Code has the right to not reveal its sources or declare, regarding names, recordings, telephone records, documentaries, electronic files, and anything that directly or indirectly may lead to the identification of the person(s) who provided information of reserved character”. 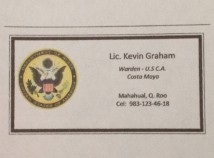 As result of the before posted, The Yucatan Times requested the United States Consulate General in Merida Yucatan information regarding Mr. Kevin Graham, who as referred on the letter, identified himself as a U.S. Warden, representing the Consular Section in the Mahahual area. Mr. Graham Business Card provided by the same person who wrote the letter. The U.S. Consulate responded to our inquiry on July 2nd 2015. 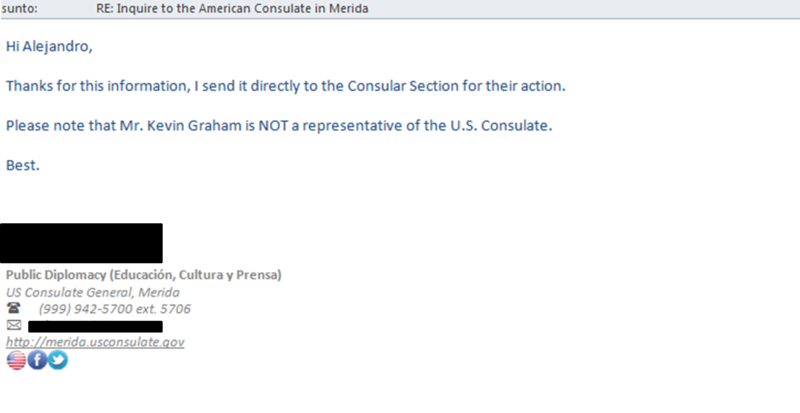 On Friday July 3rd, The Yucatan Times tried to contact Mr. Graham through his Facebook page, since it contains e-mail address and phone number. Up to today, the e-mail, has not yet been responded, so we tried to call another number provided by an anonymous source who claims Mr. Graham is currently in Texas. Like before, we got no response. 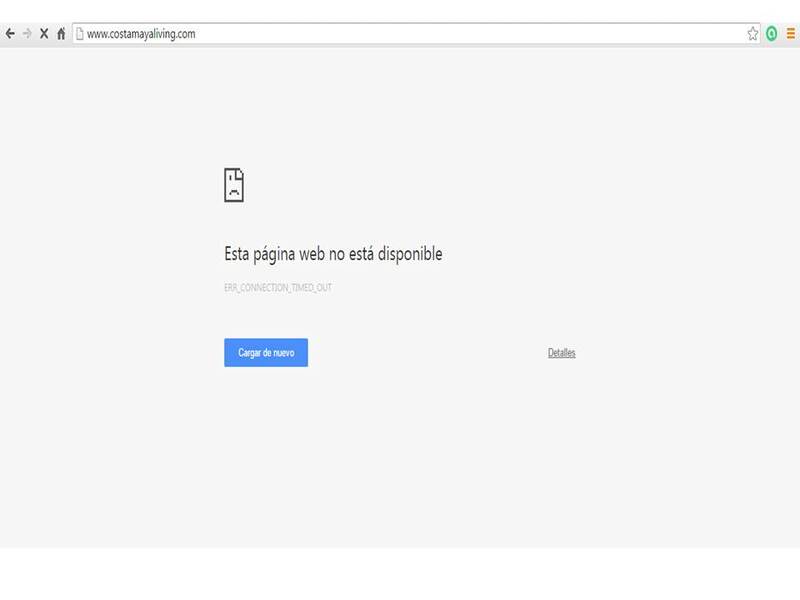 We have also tried to review the company’s website www.costamayaliving.com however at this time, it is unavailable. Under no circumstance The Yucatan Times is passing any judgment on whether Mr. Graham is guilty of any of the accusations since that is up to a Court of Law to determine. 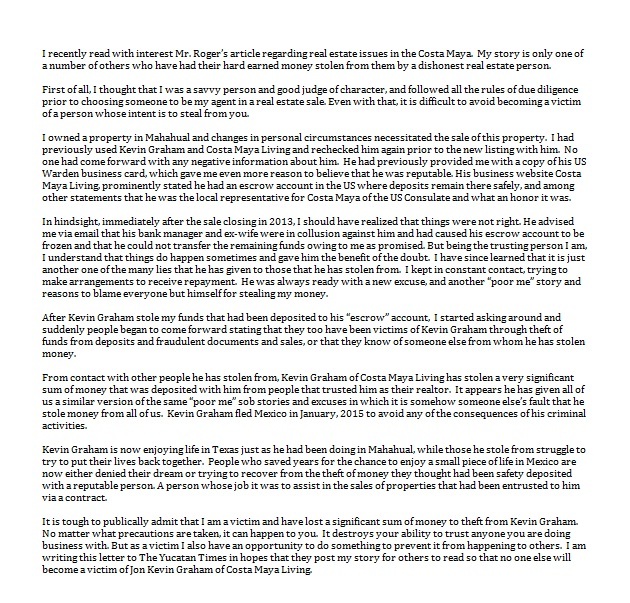 We extend an open invitation to Mr. Graham to answer those who have made these allegations as well as to others who might have any information regarding this subject. This situation is not unusual or exclusive to a certain area in Mexico. 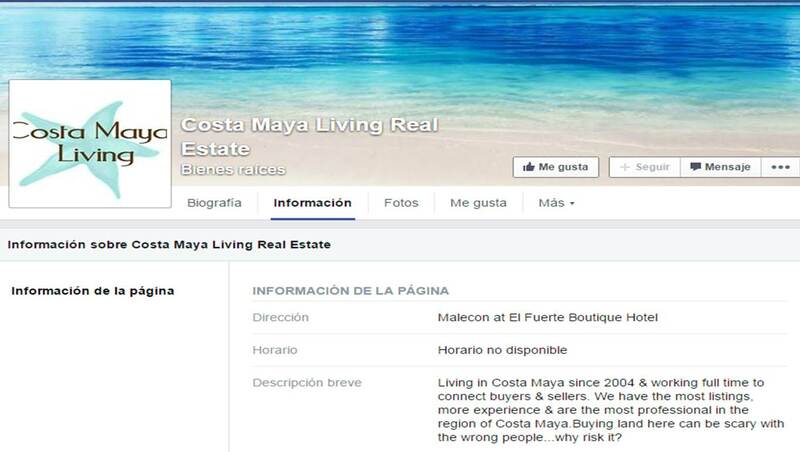 The Yucatan Times has always suggested to its readers to seek professional and qualified support while conducting real estate transactions. There, you will find a list of proven professionals ready to assist you and make sure the property you are buying is legitimate. Always deal with a Real Estate Realtor certified by AMPI (Asociación Mexicana de Profesionales Inmobiliarios) who are the equivalent of the “National Association of Realtors in the United States” and the “Canadian Association of Realtors”. Donations Form. 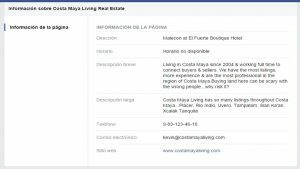 Kevin has signed it: J. Kevin Graham, Warden – Costa Maya. with a “Department of State – United States of America” logo on it. I also have a gmail email address for him. 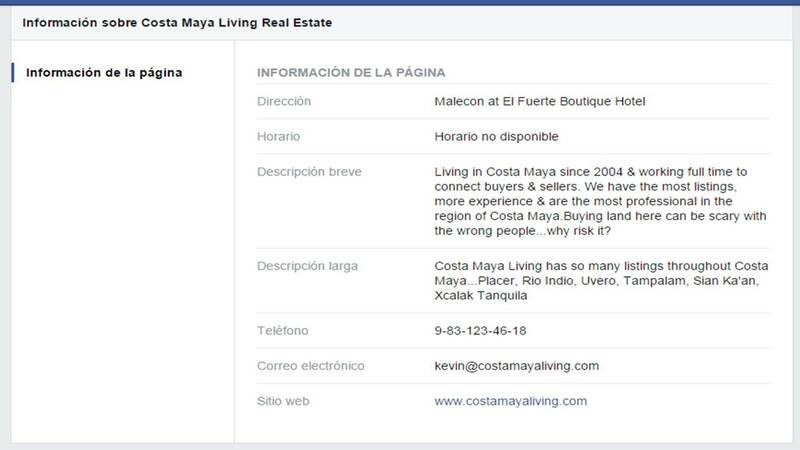 We had a similar situation with Kevin Graham purchasing a property in Costa Maya. He is dishonest and shady. I’ve been in contact with 3 other individuals who were also victims of his scams. I’m sure there are others. It´s best to do business with an established company, especially if there´s no Fideicomiso. Even then, there´s no guarantee, but there´s also the option of using a US title company such as Stewart Title. What a Deuche! I hope he gets what’s coming to him! coming to Mexico to steal from foreigners? Isn’t impersonating a federal or Government employee a federal crime? what’s the US Consulate doing about this? He conducted shady business in Mexico from a position of trust, by showing the American Eagle Stamp on his business card. He should be behind bars and not free in Texas enjoying the moneys he stole from honest people in the Riviera Maya.